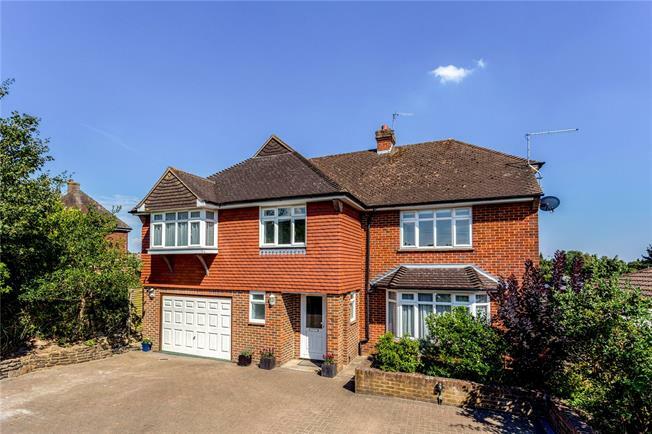 5 Bedroom Detached House For Sale in Tonbridge for Asking Price £825,000. This is a handsome, detached five bedroom house set back on a desirable road in Tonbridge. The house which is brick built and upper tile hung to front and rear has been thoughtfully extended over the years and has benifitted from a recent refurbishment. The spacious well proportioned accommodation is set over two levels and extends to 2478 square feet. A key feature of the house is a stunning kitchen/dining/family room at the rear which has been enlarged and totally refitted with a fine range of units and brand new, unused appliances. Part of the ceiling has been vaulted with skylights to flood the room with light, and French doors to the garden. A generous separate sitting room with bay window, parquet flooring and fireplace, utility room and cloakroom complete the ground floor accommodation. The kitchen benefits from contemporary units with solid oak butcher's block worktops, single bowl sink with additional kettle tap inset to the worktop with cupboards and integrated Smeg dishwasher, plus a five ring gas hob inset and a stainless steel extractor canopy over, a pair of AEG Steam bake oven and grills, built in fridge with freezer and illuminated wine cooler. On the first floor there are five double bedrooms, three with built in wardrobes and all with newly fitted carpets, plus a family bathroom with separate shower. The master bedroom also has a modern en-suite shower room. Higham Lane is conveniently located approximately a mile north of Tonbridge town centre, with its eclectic mix of shopping and leisure facilities. Schooling in the area is excellent in both private and public sectors, including the renowned Tonbridge School, and Tonbridge Grammar School. The house is approached through a five bar gate to a very extensive brick paved parking and turning area which also leads to a garage with up and over door, rear door and a range of fitted cupboards and shelving. A side gate gives access to the garden (approximately 130 ft) where there is an extensive paved patio enclosed by low brick walls. There is a delightful grapevine adorned pergola providing an ideal summer sitting area and a large timber workshop/shed with balcony. The remainder of the garden has been divided into two sections with the upper area being lawned surrounded with shrub beds, bamboo and mature magnolia. A gate leads to a further lawned area with fruit trees, acer and sycamore providing in all a secluded setting for this exceptional property.